John Magruder of "Dunblane,” Baltimore : Waverly, 1913. Nathaniel Magruder of "Dunblane,” Richmond, Virginia: Appeals Press, 1917. Nathan Magruder of "Knave's Dispute,” Extracted from the Yearbook of the American Clan Gregor Society, 1915. Thomas George Pratt, Governor of Maryland, 1845-1848; United States Senator, 1850-1857, Extracted from the Yearbook of the American Clan Gregor, Baltimore, Maryland, Waverly Press, 1913. Year Book of American Clan Gregor Society, Baltimore, Maryland, The Waverly Press, 1913. After reading all this material, I am feeling very Scottish! 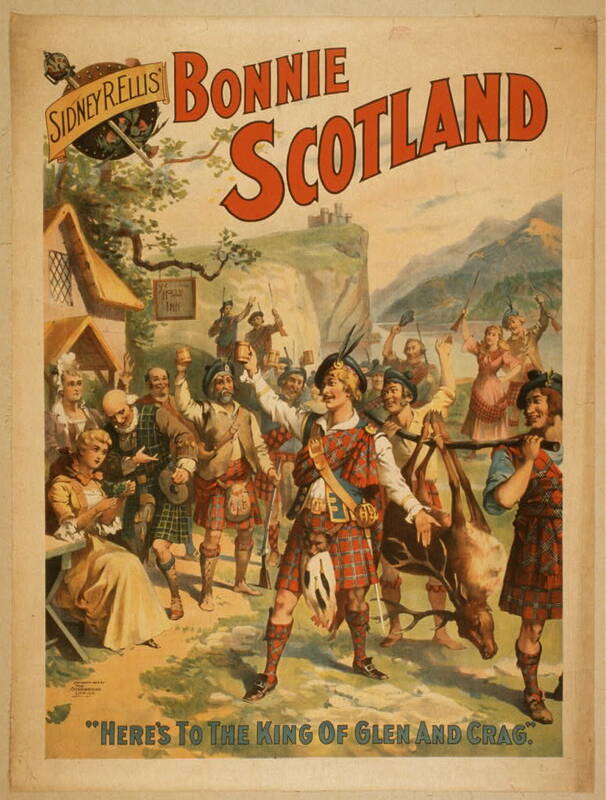 "Sidney R. Ellis' Bonnie Scotland," The Strobridge Lith Co, c1895; Prints and Photographs Division, Library of Congress (http://www.loc.gov: accessed December 24, 2012). (1) Find A Grave, Inc., Find A Grave, digital image (http://www.findagrave.com/cgi-bin/fg.cgi?page=gr&GScid=2292435&GRid=39444473&: accessed December 24, 2012), "Caleb Clarke Magruder, III (1870-1946), Memorial # 39444473, created by Margaret. (2) "Colonial Families of the United States, Vol. I" database, Ancestry.com (http://search.ancestry.com/Browse/BookView.aspx?dbid=48546&iid=ColonialFamiliesI-000567-348: accessed December 24, 2012), entry for Caleb Clarke Magruder, extracted from "Colonial Families of the United States, Vol. I.," edited by George Norbury MacKenzie, LL.B., Genealogical Publishing Co., Inc., Baltimore, Maryland, 1912, p. 348. (3) "U.S. Passport Applications, 1795-1925" database, Ancestry.com (http://search.ancestry.com/iexec?htx=View&r=an&dbid=1174&iid=USM1372_453-0802&fn=Caleb+Clark&ln=Magruder&st=r&ssrc=pt_t49405475_p20265319397&pid=1252921: accessed December 24, 2012), entry for Caleb Clark Magruder, Jr., extracted from National Archives and Records Administration (NARA); Washington D.C.; Passport Applications, 1795-1905; Collection Number: ARC Identifier 566612 / MLR Number A1 508; NARA Series: M1372; Roll #: 453. (4) "Annual Gathering of the American Clan Gregor," Evening Star, October 28, 1910, digital image, GenealogyBank.com (http://www.genealogybank.com: accessed December 24, 2012), citing original p. 16. (5) "Maryland Magruders There. American Clan Gregor to Affliate with Scottish Association, Sun (Baltimore, MD), October 28, 1911, digital image, GenealogyBank.com (http://www.genealogybank.com: accessed December 24, 2012), citing original page 13. Thank you for posting this information. In 2010 I inherited the farm house Caleb Magruder owned from 1924 until his death in 1946, "Woodstock" in Upper Marlboro, Maryland. The house was built by Washington Custis Calvert in 1853. Washington Calvert was a great grandson of King George I of Great Britain. Washington's sister married President George Washington's stepson, "Jacky" John Parke Custis.